This is the photo of a cafe at Toegyero near Chungmuro Subway Station in Seoul. I took this photo when I was on the way back to Seoul Youth Hostel during my visit to Seoul in February. The name of this cafe is Paris Baguette Cafe. It's a franchise cafe. There are many Paris Baguette Cafes throughout South Korea. 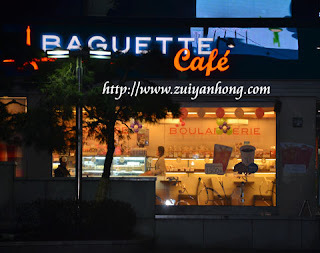 Almost every subway station in Seoul, there is a Paris Baguette Cafe nearby. Paris Baguette Cafe provides French renowned breads and confectioneries. The prices of food and beverage in Paris Baguette are pretty affordable. A cup of tea or coffee is only 1500 Won. Remember to drop in Paris Baguette Cafe to have your refreshments when you are on vacation in Seoul.